1. King Bimbisara was not merely a follower of the Blessed Lord; he was also a great devotee, and a great supporter of his Dhamma. 3. The Blessed One expressed his consent by remaining silent. 4. Then King Bimbisara, when he understood that the Blessed One had accepted his invitation, rose from his seat, respectfully saluted the Blessed One, and, passing round him with his right side towards him, went away. 6. And in the forenoon the Blessed One, having put on his under-robe, took his alms-bowl, and with his robe on, entered the city of Rajagraha, accompanied by monks who had all been Jatilas before. 7. And the Blessed One went to the palace of King Bimbisara. Having gone there, he sat down with the monks who followed him, on seats laid out for them. Then King Bimbisara with his own hands served the fraternity of monks with the Buddha at its head; and when the Blessed One had finished his meal and cleaned his bowl and his hands, he sat down near him. 10. And King Bimbisara took a golden vessel with water in it, to be poured over the Buddha’s hand; and made a gift to the Blessed One, saying, “I give this Veluvana pleasure garden, Lord, to the fraternity of monks with the Buddha at its head.” The Blessed One accepted the park. 11. Then the Blessed One, after having taught, incited, animated, and gladdened King Bimbisara by religious discourse, rose from his seat and went away. 2. “The Lord knows that I dwell in Shravasti, a land rich in produce, and enjoying peace; Pasendi is the great king thereof. 4. The Blessed Lord kept silent and thereby showed his willingness to accept the gift. 5. Anathapindika, the friend of the destitute and the supporter of orphans, having returned home, saw the garden of the heir-apparent, Jeta, with its green groves and limpid rivulets, and thought: “This is the place which will be most suitable as a Vihara for the fraternity of the Blessed One.” And he went to the prince and asked leave to buy the ground. 7. Anathapindika rejoiced and began to spread his gold; but Jeta said: “Spare yourself trouble, for I will not sell.” But Anathapindika insisted. Thus they differed and contended, until they resorted to the magistrate. 9. Having made the foundation, they began to build the hall which rose loftily in due proportions, according to the directions which the Blessed One had given; and it was beautifully decorated with appropriate carvings. 10. 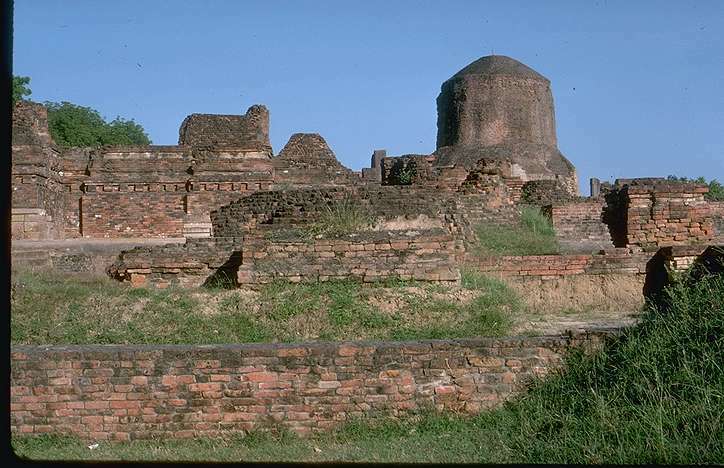 This Vihara was called Jetavana, and the friend of the orphans invited the Lord to come to Shravasti and receive the gift. And the Blessed One left Kapilavastu and came to Shravasti. 13. Anathapindika was one of the eighty chief disciples who bore the title of Chief Almsgiver. 1. Jeevaka the physician visited the Blessed One twice a day, whenever the Blessed One happened to be in Rajagraha. 2. Jeevaka found the Veluvana, gifted away to the Blessed One by King Bimbisara, too far away. 3. Jeevaka had his own park in Rajagraha, known as Ambavana, which was much nearer from [=to] his place. 4. He thought of building a Vihara with all its adjuncts, and present[ing] the Ambavana and the Vihara to the Blessed One. 5. With this idea in his mind he approached the Blessed One, and requested him to let him fulfil his wishes. 6. The Blessed Lord showed his acceptance by remaining silent. 2. “So be it. Lord,” said Ananda, in assent, to the Exalted One. 3. Then the Exalted One proceeded, with a great company of the brethren, to Vesali, and there at Vesali, the Exalted One stayed at Ambrapali’s grove. 4. Now the courtesan Ambrapali heard that the Exalted One had arrived at Vesali, and was staying there at her mango grove. And ordering a number of state vehicles to be made ready, she mounted one of them, and went forth with her train from Vesali towards her garden. She went in the carriage as far as the ground was passable for carriages; there she alighted, and she proceeded on foot to the place where the Exalted One was, and took her seat respectfully on one side. And when she was thus seated the Exalted One instructed her with religious discourse. 6. And the Exalted One gave, by silence, his consent. Then when Ambrapali the courtesan saw that the Exalted One had consented, she rose from her seat and bowed down before him; and keeping him on her right hand as she passed him, she departed thence. 7. Now the Licchavis of Vesali heard that the Exalted One had arrived at Vesali, and was staying at Ambrapali’s grove. They too wanted to invite the Buddha to their place for a meal. And ordering a number of state carriages to be made ready, they each mounted one of them and went forth with their train from Vesali. 8. They and Ambrapali crossed on the way. 10. “My Lords, I have just invited the Exalted One and his brethren for their morrow’s meal,” said Ambrapali. 11. “Ambrapali, sell this honour to us fora hundred thousand,” said they. 13. The Licchavis cast up their hands, exclaiming: “We are outdone by this mango girl. We are out-reached by this mango girl,” and they went on to Ambrapali’s grove. 14. Knowing that they were outdone, they still thought of approaching the Blessed One, in the hope that he might reconsider and give their invitation first preference. So they went on to Ambrapali’s grove. 16. And when they had ridden as far as the ground was passable for carriages, the Licchavis alighted there, and then went on foot to the place where the Exalted One was, and took their seats respectfully by his side. 18. “I have promised, Licchavis, to dine tomorrow with Ambrapali,” was the reply. 19. Then the Licchavis knew that they had failed. And after expressing their thanks and approval of the words of the Exalted One, they rose from their seats and bowed down before the Exalted One, and keeping him on their right hand as they passed him, departed thence. 21. And the Exalted One who had dressed himself early in the morning, took his bowl and his robe, and went with the brethren to the place where Ambrapali’s mansion was; and when he had come there he seated himself on the seat prepared for him. And Ambrapali, the courtesan, set the sweet rice and cakes before the order, with the Buddha at their head, and waited upon them till they refused any more. 23. ” Lord, I present my pleasance to you and to the order.” And the Exalted One accepted the gift; and after giving a religious discourse, he rose from his seat and took her leave. 1. Vishakha was a wealthy woman of Shravasti. She had many children and grandchildren. 2. When the Blessed One stayed at Shravasti, Vishakha went up to the place where the Blessed One was, and tendered Him an invitation to take his meal at her house, which the Blessed One accepted. 3. And heavy rain fell during the night and the next morning; and the bhikkhus doffed their robes to keep themselves dry, and let the rain fall upon their bodies. 9. And Vishakha replied: “I gave command, Lord, to my maid-servant, saying, ‘Go thou and announce to the fraternity that the meal is ready,’ and my maid went, but when she came to the vihara, she observed that the bhikkhus had doffed their robes, while it was raining, and she thought: ‘These are not bhikkhus, but naked ascetics letting the rain fall on them.’ So she returned to me and reported accordingly, and I had to send her a second time. 10. “Impure, Lord, is nakedness, and revolting. It was this circumstance, Lord, that I had in view in desiring to provide the Sangha throughout my life with special garments for use in the rainy season. 11. “As to my second wish. Lord, an incoming bhikku, not being able to take the direct roads, and not knowing the places where food can be procured, comes on his way wearied out by seeking for alms. It was this circumstance, Lord, that I had in view, in desiring to provide the Sangha throughout my life with food for incoming bhikkhus. 12. “Thirdly, Lord, an outgoing bhikkhu, while seeking about for alms, may be left behind, or may arrive too late at the place whither he desires to go, and will set out on the road in weariness. 13. “Fourthly, Lord, if a sick bhikkhu does not obtain suitable food, his sickness may increase upon him, and he may die. 14. “Fifthy, Lord, a bhikkhu who is waiting upon the sick will lose his opportunity of going out to seek food for himself. 15. “Sixthly, Lord, if a sick bhikkhu does not obtain suitable medicines, his sickness may increase upon him, and he may die. 16. “Seventhly, Lord, I have heard that the Blessed One has praised rice-milk, because it gives readiness of mind, dispels hunger and thirst; it is wholesome nourishment for the healthy, and for the sick as a medicine. Therefore I desire to provide the Sangha throughout my life with [a] constant supply of rice-milk. 17. “Finally, Lord, the bhikkhunis are in the habit of bathing in the river Archiravati with the courtesans, at the same landing-place, and naked. And the courtesans. Lord, ridicule the bhikkhunis, saying, ‘What is the good, ladies, of your maintaining chastity when you are young? When you are old, maintain chastity then; thus will you be obtainers of both ends.’ Impure, Lord, is nakedness for a woman, disgusting, and revolting. 20. Vishakha replied: “Bhikkhus who have spent the rainy season in various places will come, Lord, to Shravasti to visit the Blessed One. And on coming to the Blessed One they will ask, saying: ‘Such and such a bhikkhu. Lord, has died. What, now, is his destiny?’ Then will the Blessed One explain that he has attained the fruits of conversion; that he has entered Nirvana or attained arhantship, as the case may be. 25. Vishakha gave to the Order the Purva-Aram or Eastern Garden, and was the first to become a matron of the lay-sisters. IT’s open season on the Web! OPEN HOUSE: The latest version 3 of the Firefox browser can be downloaded on June 17, while the new desktop version of Ubuntu linux is already available. Bangalore: Within weeks of each other, the most popular Open Source operating system and one of the most used web browsers for lay users have unveiled their latest avatars — and chances are they will attract millions of first-time users. On Tuesday, the third edition of Firefox will become available for free download. Such is the build-up and hype for this Open Source web browser that 1.6 million users have already pre-registered to get the software on Download Day, June 17 — and as of Saturday, 21,300 of them are based in India. Mozilla, which promotes Firefox, hopes to create a Guinness World Record for the highest number of downloads on a single day (downloads can be done from http://www.spreadfirefox.com /en-US/worldrecord/firefox3). Firefox has a reputation for blocking viruses and other malware more effectively than many competing offerings, and many users whose PCs or laptops run on proprietary systems still choose to browse with Firefox. The browser has ironed out almost all its minor glitches during months as a beta and what is offered now is a robust version. Going by the pre-release versions, Firefox 3 will be available in the Punjabi and Gujarati versions also. The switch to an Open Source operating system has become just a bit easier, with the recent availability of the latest version — 8.04 — of the Linux distribution, Ubuntu. A free download from Canonical, U.K., Ubuntu has become one of the most popular Linux flavours — and the latest version can be saved on a DVD and will run directly from that drive without disturbing whatever operating system one may be running. It can be downloaded from www.ubuntu.com/download but since the full software takes almost 4 GB, readers may prefer to use one of the free DVDs being offered with the June 2008 issues of the computer monthlies Digit and Chip in India. This correspondent used the Chip DVD and it opened Ubuntu in trial mode on a Windows Vista PC, allowing sampling of all its features, including the OpenOffice suite and the Open Source graphics software GIMP, which are bundled. At the end of the trial the DVD can be removed and the PC returned to the Vista desktop, without hassle. This feature alone will give many first-time users the courage to give Open Source a try. Lathi-charge and firing on farmers in Haveri is “the worst treatment” ever meted out to them. Perhaps, the Bharatiya Janata Party has introduced the “Gujarat model of governance” in the State in right earnest. Who ordered the firing? The provocation for it and the procedure for opening fire were issues that should be probed. The probe was entrusted to the Divisional Commissioner as the Government wanted to cover up mistakes. Victims belonged to the Kuruba and other castes.